In late 1963 my sister came to visit us while we were living in Rhodesia. At the time she was working for a bank and enjoyed the company of an influential circle of friends. She drove a Porsche and apparently was doing rather well, well enough to take three weeks off of work to visit Africa. Father decided to take us all on a grand tour that started with a run through Mozambique, an extended visit to the Kruger Game Park, the Natal Coast, Pretoria, Johannesburg and Cape Town. The return trip took us to East London and Port Elizabeth. Normally when traveling to South Africa we would have crossed the border at Beit Bridge, a small town just an hour or two south of Bulawayo, itself then a small town that served as market town and rail head for the European farmers who had settled in the region. This time we drove down to Beira, the larger of the two port cities in Mozambique, and then down the coast to Lourenço Marques (now known as Maputo). I remember that it rained for most of the trip down the coast to Lourenço Marques. We were in for a bit of a treat when we got to Lourenço Marques. The city was host to a road rally. There were all manner of hussied up sports cars and the teams that supported them. The cars all had these cables that connected the front wheels to instruments attached to the dashboard. The teams consisted of the drivers and their navigators. The hotels were chuck full of Europeans who were either part of the rally teams or avid fans. Despite the continued rain, it was a very festive atmosphere. What’s more, my sister who was engaged to a race car driver at the time, had a very keen interest in road rallies. She knew the lingo having participated in rallies herself. Understandably, she got along very well with the other guests in the hotel where we stayed. At my sister’s insistence, we stayed in Lourenço Marques for an extra day so that she could watch the rally and hob knob with the team members. While there, somebody turned her on to some kind of “special” local cigarette. Despite its special nature, it was perfectly legal and readily available. I don’t remember the brand or the color of the packaging, but she managed to buy a few packs prior to our departure. After she started smoking these cigarettes, she was given to unusual behavior, the most obvious (to me) being her choice of cuisine at dinner. The last evening in Lourenço Marques the menu offered Curried Monkey Brains. I remember that she ordered and savored that dish. Lourenço Marques was then and still is a very picturesque city. The hotel was located in an older quarter that featured a network of intimately scaled streets and Portuguese colonial edifices interlaced with wide formal avenues lined with what I’ve since learned are acacia trees. Even at the age of eleven I was left with the impression that the older colonial era buildings were especially well proportioned. After leaving Lourenço Marques we headed to the Kruger Game Park where we spent one or two days before driving on to Durban. Whenever my sister was puffing away on these cigarettes she seemed unusually happy. Years later she would tell me that after she smoked one of these I would be transformed from an obnoxious eleven year old into a quite agreeable cartoon. And then, just as we were arriving in Durban, she ran out of those special cigarettes. That’s when she started to become somewhat disagreeable and unusually short-tempered. Years later, based upon my own experiences, I’m able to speculate that whatever the active ingredient in these cigarettes was, it was either some form of cannabis or possibly narcotic in nature. So, while the rest of us thoroughly enjoyed ourselves in Durban, sister moped about in the spacious suite father booked in an ocean-front hotel. That part of Durban actually didn’t have any ocean-front hotels per se, rather there was a Corniche with beach parks on the ocean-side and hotels on the opposite side. 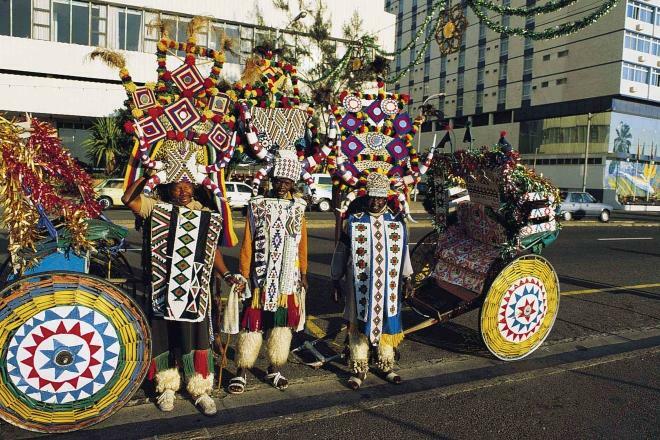 At one point we hired some elaborately attired Zulu tribesmen (pictured above) to cart us around on rickshaws. It wasn’t tourist season so we pretty much had the place to ourselves. But sister still wanted some more of those Mozambican cigarettes. So she went down to the front desk and asked where they could be purchased. At first nobody knew what she was asking for but eventually one of their employees who was from Mozambique did. No, they weren’t available in Durban. By the time we left Durban for the drive up to Pretoria and Johannesburg she was getting very difficult to be around. When we got to Pretoria we stopped by the US Embassy to see if anyone there knew how to get ahold of these cigarettes. Not only were they not sold in South Africa, although not specifically outlawed, they were frowned upon. Since my sister was quite insistent, father persuaded somebody on the Embassy staff to have somebody on the US Consulate staff in Lourenço Marques go out and purchase a carton or two and send them up in the diplomatic pouch. Only years later did sister relate that father had been reluctant to have this done and was quite embarrassed at the time. All I can remember was that she had enough of those cigarettes to remain reasonably agreeable for the duration of her stay in Africa. More recently while employed in the Emirate of Sharjah, I enjoyed the company of a coworker named Paulo who was born and raised in Lourenço Marques. As he is considerably younger than I, he refers to that city as Maputo. He carries with him a collection of photos of some of the more recent edifices, including some of the outstanding modernist works of Pancho Guedes. Paulo presently resides in the UK where he’s slogging through the Part 2 requirements to become an architect. He reports that though there are opportunities in the UK, the weather is dismal. He misses Mozambique where, using his words, the people are poor but everybody wears a smile. Before writing this piece, I asked him if he knew of those special cigarettes my sister had warmed to. He didn’t know and neither did his mother. It’s a pity I couldn’t remember much about them. It appears they’ve been lost to history.